Atlas was one of the legendary Titans battling Zeus. After his defeat, he was condemned to stand at the western edge of Gaia, the Earth and hold up on his shoulders Ouranos, the celestial sphere till the end of the world. 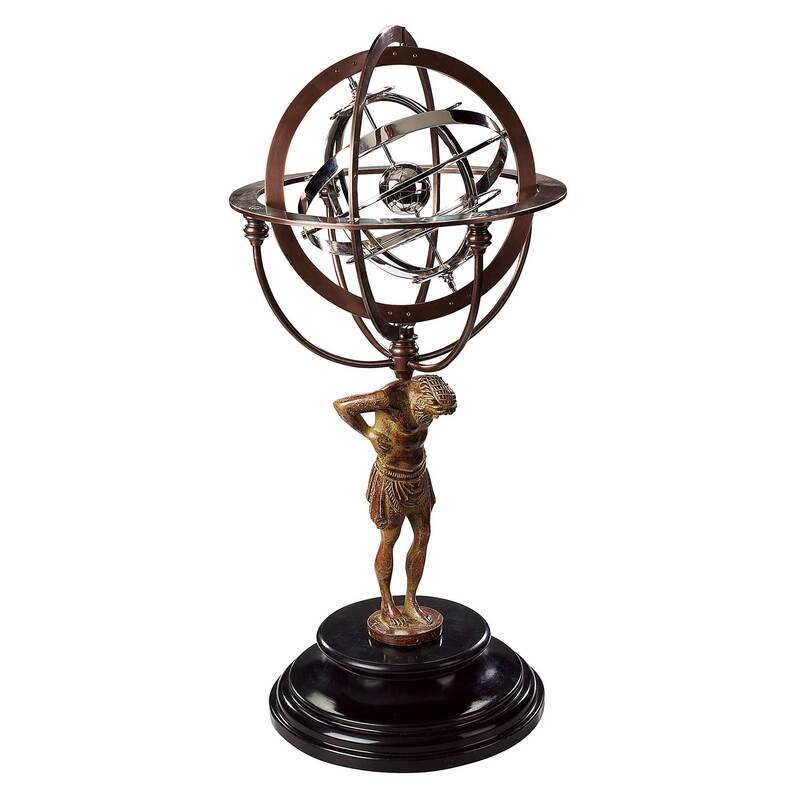 The Atlas of this very beautiful and heavy armillary sphere supports here the whole universe, or at least the known Renaissance universe. In all aspects ethereal, myth combined with science, fable with historic fact. An armillary sphere is a representation of the antique concept of celestial sphere or orbs, invented by greek philosophers. The Firmament was assimilated to a sphere centered on Earth. During Antiquity and the Middle Ages, the stars were considered as equidistant from the center and an armillary sphere was assumed to be an exact representation of the universe. Even if now know that this model is wrong, it remains a very practical abstraction for the astronomy of position. The Earth is represented by a ball placed in its center on the polar axis. These machines were used as teaching tools and, for the largest of them, as observation instruments, in particular by Ptolemaeus. 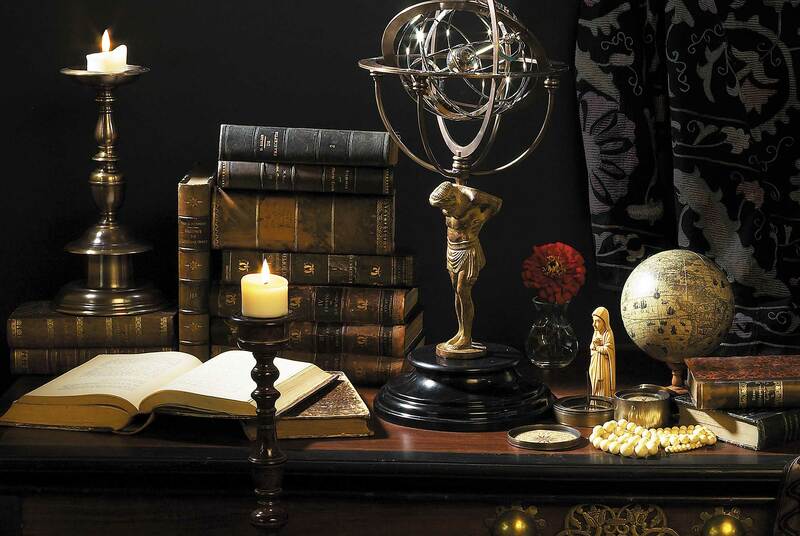 The paintings of the scientists and the notables of the Renaissance often show them with a hand on an armillary sphere which represented the top of knowledge and wisdom. About spheres and calendars from D.F. de Rivard (1804, in french), explaining the use of an armillary sphere can be consulted on-line (google-scan) here or downloaded here. AM is a Dutch company created in 1968 by Haring Piebenga. Its focus is to create a comprehensive collection of historical objects and fine art reproductions in museum quality. AM proposes reproductions that appeal to a need for nostalgia, intrigue, and beauty. All its products are designed in house, by its own design team. Originals are pursued at auction and reproduced with an AM twist. Average of 4,6 based on 10 reviews. NO review is available in english. Back to list "Antique Globes..."